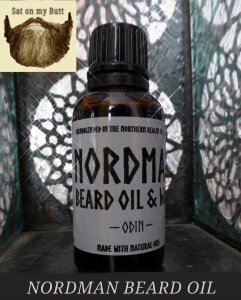 I have been usingNordman ‘ODIN’ Beard Oil a brand that embodies the Viking spirit. Its made in the UK and is the brainchild of a guy called Stuart who clearly has a passion for our ancient visitors from overseas. Once I had washed my beard I applied some oil to the palm of my hand and then rubbed my hands together to warm the oil, I gently worked the oil through my beard and then used a brush to make sure it was distributed thoroughly. I always then wait a couple of minutes and then comb my beard into shape and ‘Odin’ gives a gentle hold to the beard leaving it looking tidy. The oil has a nice feel, not greasy at all and works into the beard and skin nicely, it has a herby lavender smell but it isn’t overbearing. Overall a nice oil that will leave your beard feeling good and alleviate that dry feeling, it will also help stop beard itch and beardruff. Hemp Seed Oil is known as a gentle moisturizer which gradually alleviates dryness, flakiness and itchiness. This unique ingredient also provides anti-inflammatory properties which can help thwart the signs of aging skin. Jojoba Oil is the only known oil which closely resembles the oil naturally produced by our skin. This dynamic oil reduces inflammation and deeply nourishes the hair and skin in order to prevent dryness and irritation that can lead to what we call ‘beard-ruff”. Sweet Almond Oil fortifies hair follicles to reduce breakage but also conditions facial hair for a tangle-free and more manageable beard. Rosemary Essential Oil not only offers an energizing herbal aroma, it also naturally stimulates hair follicles in order to encourage healthier and fuller beard growth. Cedarwood Essential Oil tones oily skin, cleanses to prevent acne and purges the skin of toxins for an overall healthier complexion. Not to mention, the masculine scent is considered a natural aphrodisiac thanks to its stimulating and invigorating qualities. Clary Sage Essential Oil regulates the natural production of sebum oil on the surface of your skin. By doing so, it helps combat acne, oily skin and clogged pores. Similarly to Cedarwood essential oil, clary sage oil is also known as an aphrodisiac. Lavender Essential Oil contains anti-fungal, anti-bacterial and anti-inflammatory properties, which is why it is used to treat itchy and irritated skin. It also provides a subtly clean and refreshing fragrance that gently calms the mind and body. This is a nice oil. The scent is amazing! It was nice to have a bottle that supplied a decent amount of oil into my hand after just a few shakes.